On October 4 2015 it was confirmed that Da’esh destroyed the Severan-era triumphal arch at Palmyra. The initial notification was from Khaled al-Homsi on Twitter, followed by a report from The Huffington Post on October 4 2015. It was also reported by the DGAM, The Independent, the BBC, the New York Times, Le Monde, and CNN on October 5 2015. On October 8 and 9th, images of the destruction surfaced. For video posted by ABC News (October 8 2015), see here. The DGAM posted pictures on October 9 2015 here. Allegations surfaced on October 6 2015 that Daesh had ‘rigged’ the amphitheatre at Palmyra with explosive charges, found on SputnikNews here, although it must be noted that this may be the same report from June resurfacing. If anyone knows if this is a new event or the same one, please do let us know. The Times (UK) reports on September 25 2015 that bombs dropped on Palmyra damaged the medieval citadel here. 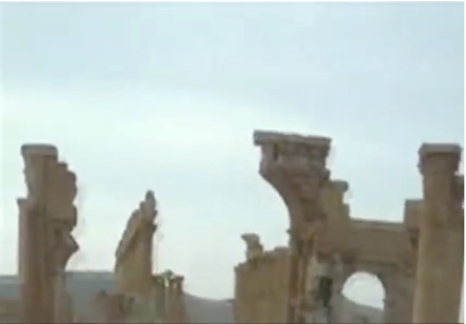 The BBC (October 5 2015) has released a series of images of the damage done to Palmyra so far, with discussions and interviews with scholars, here. Tweets were circulated on 12 October that Da’esh next plan to destroy the rest of the arch, the theatre and the terapylon. 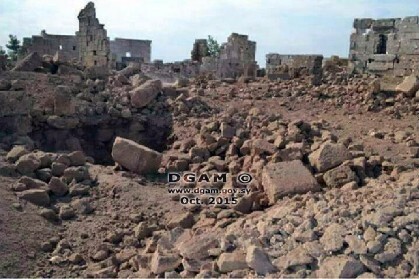 Now.me reports on October 1 2015 that an airstrike damaged or destroyed the late Roman site at Shanshrah, part of the World Heritage Site The Ancient Villages of Northern Syria, here. Reports of damage were verified by the DGAM here. The DGAM reports on September 30 2015 that illegal mechanical excavations have been taking place at Tall al-Kasra and Tall as-Sin near Deir Ez-Zor . The brief can be found here. See International Actions: Conflict Antiquities: Forging a Public/Private Response to Save the Endangered Patrimony of Iraq and Syria, for details of the new links between Da’esh and looting (receipts siezed totallying $1.25billion). 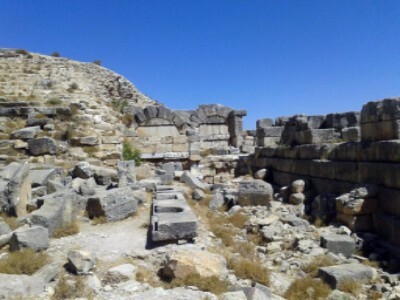 The DGAM reports that the site of Cyrrhus/Nabi Houri is in good condition, apparently due to proactive measures by the local community there to protect it. See the report here. The DGAM has released a short statement about Palmyra on September 28 2015 here. The DGAM Director General welcomes Russian airstrikes on October 6 2015 report from Newsweek here. One Syrian’s reflection on the meaning of Palmyra for her: “My love story with Palmyra”. The Illicit Cultural Property blog reports that the ICC “may be on the verge of dramatically increasing the profile of cultural heritage crimes”, after proceedings began against the man who destroyed the shrines in Mali. For full discussion, see here. On September 29th, the Metropolitan Museum in New York hosted a meeting: “Conflict Antiquities: Forging a Public/Private Response to Save the Endangered Patrimony of Iraq and Syria.” Links to all publications, summaries, and releases relating to this event are available on the UK Blue Shield website here. Videos of the conference can be found here, and event summaries here and here. The US State Department announced on September 29 2015 at the Metropolitan Museum of Art in New York that its ‘Rewards for Justice’ program will now offer up to $5M USD for “or information leading to the significant disruption of the sale and/or trade of antiquities and oil by, for, on behalf of, or to benefit ISIL.” For the State Department releases, see here. The Gates of Nineveh blog provides an excellent summary of the information released at that event: New documents show definitely that Da’esh is ‘heavily involved in antiquities trafficking’, and that seized receipts demonstrate Da’esh has made more than $1.25 million from looting (September 30 2015). The UK Blue Shield are collating information regarding previous events on cultural heritage in conflict and during natural disasters. The information they currently have is available on their website. They are looking for summaries and slides, to collate what has previously occured. If anyone has anything, please get in touch with Dr. Emma Cunliffe at (emma.cunliffe@arch.ox.ac.uk). This page will be regularly updated. A new German project, ILLICID, is starting in 2015 for a 3-year period. The project’s scope includes an ‘explorative study with special attention to archaeological objects from Iraq and Syria’, and hopes to form policy recommendations for those involved with cultural property, and to build a database for collecting information and tracking the movement of objects. ‘In the light of the Resolution 2199 of the UN Security Council (15 February 2015) the urgency and importance of such a project becomes more apparent’, said Dr. Markus Hilgert, ILLICID network coordinator. Next to comprehensive data collection, the project aims to develop recommended actions for actors in the trade with cultural property, to set up a database to collect information, for instance, about suspicious auctions. These data will then be made available to investigators via a dedicated app. For details, see here. The Asia Society held a high level event, “Culture Under Threat: The Security, Economic and Cultural Impact of Antiquities Trafficking and Terrorist Financing” on September 24th, attended by Irina Bokova of UNESCO, numerous Middle Eastern Foreign Ministers, and many senior heritage figures. See their report here. A social media play-by-play can be found here. The Council on Library and Information Resources took note of the conference, and highlights their suggestion “to develop a Digital Library for the Middle East”. UK Blue Shield has links to summaries and videos here. The Archaeological Institute of America (AIA) and American Schools of Oriental Research (ASOR) have received a special grant to conduct a two-day Syrian Cultural Heritage Summit at the National Geographic Society in Washington, D.C. Participating organizations will be collecting data on cultural heritage in the war-torn country, and will explore ways to not only cooperate but also to maximize documentation efficiency and joint efforts. Details of the event, to be held in December, are available here. The Antiquities Coalition has started a petition on change.org: “A Call to Action to Protect the World’s Cultural Heritage”, which can be found here. The Boston MFA is paying tribute to Khaled al-Asaad with an interactive display that features a ‘seldom-seen’ funerary bust from Palmyra, according to the Boston Globe. The UN has launched a new initiative “Protecting Cultural Heritage – An Imperative for Humanity” on the occasion of the 70th session of the general assembly in New York. UNESCO DG Bokova said that “Culture is on the frontline of conflict – we must place it at the heart of peacebuilding.” See the report here. See also The Huffington Post article (October 3 2015) on discussions about protecting heritage in and around the UN General Assembly here. Wellesley College held a conference, “Erasing the Past: Da’esh and the Crisis of Antiquities Destruction” on September 24, 2015. Information about the conference can be found here. Conference in Amman, Jordan (28-30 September 2015): “Protecting the Past: Archaeology, conservation and tourism in the north of Jordan.” Schedule can be found here. Vanderbuilt (USA) held a lecture and exhibition Launch: “Protecting Cultural Heritage in Syria and Iraq” and “Syria Widowed: Remembering Palmyra” respectively on September 22. Details are here. The Art and Cultural Heritage Law Committee held a discussion about destruction and looting of cultural property in Syria and Iraq on September 22. See here for details. Public lecture in Sydney Australia entitled “The Heritage of Palmyra” by the Near Eastern Archaeology Foundation, University of Sydney. Details are here. Workshop in Brussels, Belgium (September 15-16 2015) entitled “Importance of Provenance Research and Cultural Heritage Protection.” Details can be found here. A French parliamentary delegation visited the DGAM on September 29 2015 to discuss issues of mutual interest concerning Syrian heritage. See the brief from DGAM here. The Association of Art Museum Directors (AAMD) has provided new guidelines to assist in “aiding cultural organizations and institutions to better understand how to shepherd works of art and archaeological objects of importance that are at risk of being damage, looted, or destroyed”. They can be accessed here. See the critical response to this from Larry Rothfield on October 3 2015 here. The Getty Research Institute in Los Angeles has acquired 47 rare 19th C prints taken by Louis Vignes, a French naval officer, across the Levant. The collection includes valuable prints of now-destroyed buildings, such as the Temple of Baalshamin at Palmyra. See the report from the Art Newspaper (October 2 2015) here. On October 2 2015 the Gates of Nineveh blog considers Russia’s intervention in Syria, including what it means for Syrian heritage here. The Globe and Mail takes a detailed look at the Palmyrene situation on October 1 2015 here. Possible links to money laundering and trafficking of stolen antiquities are discussed by Rick St. Hilaire on September 30 2015 here. The Daily Beast returns on September 30 2015 to examine the the raid carried out in May on Abu Sayyaf’s compound in Syria here. Vice asks where looted antiquities go on September 30 2015. The Elite Daily on September 29 2015 accuses the US of “sleeping on a way to hurt ISIS and protect culture” by dragging its feet in a bill, sitting in the House since June, that would harm ISIS’ ability to profit from looting. The article can be found here. CBS examines plundering of antiquities by Daesh on September 29 2015 in a report, found here. Ronald Tiersky for The World Post (September 29 2015) examines the ways in which IS profits from looting and the sale of cultural artefacts here. Robert Fisk in The Independent on September 27 2015 argues that Russia’s new military campaign in Syria is intended to recapture Palmyra here. The Detroit News reports on September 27 2015 on the provision of 3D cameras from the international community to Syrian archaeologists to scan threatened artefacts here. Dr. Judith Weingarten on September 30 2015 remembers better times at Palmyra at her blog, here. Pinar Tremblay in the Al Monitor (September 25 2015) argues that stolen Syrian artefacts are passing through Turkey. The role of illegal sale of antiquities in funding Daesh has been satirsed in The Daily Show (September 30 2015), discussed in The Independent (September 30 2015) and the Huffington Post (October 1 2015). Franklin Lamb discusses the problems of looting in Syria, and some of the suggestions to tackle it in Counterpunch on October 2 2015.